Back in 1984, Fangoria magazine did a story on a little movie called Blood Simple. As I was knee-deep in my obsession with "alternative movies", I convinced my sister's boyfriend to take me to see it. I didn't know much about film noir, but I admired the movie's kooky spirit. This was my introduction to Joel and Ethan Coen. I also enjoyed their next movie, Raising Arizona, and found things to like about their next few movies. But, as the brothers gained more and more Hollywood clout, and began to make Oscar-winning movies, I found myself growing more and more removed from their creations. Despite this, I still check out their movie, hoping that they will find a way to return to their indie roots. Hail, Caesar! shows that there may be no turning back. Hail, Caesar! takes us into the world of Hollywood in the 1950s. Eddie Mannix (Josh Brolin) is a hotshot at Capitol Pictures and he does everything he can to keep things running smoothly. The big movie being shot on the lot is Hail, Caesar, a Biblical epic featuring the big star Baird Whitlock (George Clooney). The movie is already costing a fortune and things get even weirder when Whitlock suddenly disappears. Meanwhile, it's been decided that singing cowboy Hobie Doyle (Alden Ehrenreich) should be featured in a drama, despite the fact that he's never really spoken on-screen. Swimming spectacular starlet DeeAnnan Moran (Scarlett Johansson) is also a concern of Eddie's, as she can no longer fit into her mermaid tail. Also, Eddie has to put up with twin gossip columnists Thora and Thessaly Thacker (Tilda Swinton). While all of this is going on, Eddie is considering a career change. The Coens clearly have an interest in "old Hollywood", going back to their 1991 entry Barton Fink. That film took a much darker look at filmmaking, as a writer found himself in over his head, and I believe that there was a serial killer involved. (I have seen that movie in over two decades.) Hail, Caesar! is a much, much lighter work, as The Coens have moved away from their typical downer ways and turned in a film which is bursting with Technicolor tones. In an attempt to re-create the look and feel of Hollywood blockbusters of that era, we are treated to very rich reds and greens and the sort of detailed sets which were a hallmark of the 1950s. It's clear that a lot of work went into taking us into this world and showing the affection which The Coens have for it. And whether it's one of their original works or an adaptation, The Coens are know for writing intricate, deep stories with unique, often damaged characters. Again, they are changing things up here and Hail, Caesar! has a much more simplistic storyline, and this is where the film begins to fall apart. The movie traces one day in the life of Eddie Mannix, as he attempts to keep the studio from going off of the rails, while contemplating a career change, while taking care of his family. Given this premise, the movie is simply a series of loosely connected scenes showing Eddie going from one crisis to another. The movie also focuses on what is going on with Whitlock and a studio-arranged date for Hobie. Hail, Caesar! is not a complex film and we can see what The Coens are doing with these stories, but they don't gel very well and none of them are particularly interesting. While the backdrop of a Hollywood studio in the 50s may be somewhat unique, we've seen all of this before. The Whitlock scenes really bring the movie to a halt, and while they have some mystery elements at first, once all is revealed, there is a feeling of "Oh, that's it?" The thing that you have to understand is that, in The Coens' minds, they've made a madcap comedy. But, what is a zany movie to these overly-serious hipsters is going to seem very mundane to most people. I watched scene after scene which I could just picture them chuckling away at what they considered to be over-the-top humor, but it's all mildly-amusing at best. (Although, I would not be surprised to learn that "art-house" crowds were in tears over this.) There's a world of difference between watching a movie and thinking, "I can see how that was supposed to be funny." and it actually being funny. There is a long, drawn out scene in the finale that I'm assuming was supposed to be hysterical, but it was simply torturous. In one of the featurettes included on the Blu-ray Disc, several of the actors stated that when The Coens ask you to be in their film, you say yes. Perhaps they should have read the script more closely. There's no doubt that a great cast has been assembled here. Along with those listed above, there are appearances by Alison Pill, Ralph Fiennes, Jonah Hill, and Frances McDormand. And, as noted above, the movie looks great. But, the result is a bunch of familiar faces walking through splendid sets and working with a weak script. I applaud The Coens for trying something different, but they've definitely lost the zany quality which they had years ago. Hail, Caesar! doesn't get any help from its musical numbers on Blu-ray Disc courtesy of Universal Studios Home Entertainment. The film has been letterboxed at 1.85:1 and the Disc contains an AVC 1080p HD transfer which runs at an average of 35 Mbps. The image is very sharp and clear, showing no grain and no defects from the source materials. As previously stated, the colors look fantastic, with the Technicolor-like tones leaping off of the screen. The image is never overly dark or bright. The depth is very impressive, giving the image a very immersive quality and the level of detail is impeccable. The Disc carries a DTS-HD Master Audio 5.1 track which runs at 48 kHz and an average of 3.8 Mbps. The track provides clear dialogue and sound effects. This is an interesting track, as it offers a variety of sounds. The musical numbers (while dull) offer boisterous music with fills the speakers. We get some nice stereo and surround effects from the crowded sets, as we are treated to sounds coming from off-screen. The finale brings in some subwoofer effects as well. 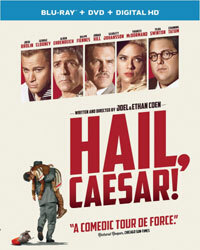 The Hail, Caesar! Blu-ray Disc contains just a few extras. "Directing Hollywood" (4 minutes) has the cast talking about their reaction to being asked to work with the Coens and what the experience was like. We get some on-set footage here. "The Stars Align" (12 minutes) gives the actors an opportunity to talk about their characters and the film's look at the interactions of those in the film business. The costumes, sets, and production design are explored in "An Era of Glamour" (6 minutes). "Magic of a Bygone Era" (6 minutes) is a look at how the movie business was different 50 years ago, in terms of the kinds of movies which were made and how everyone acted.